will calcium reverse osteoporosis | Dr. CECILIA de MARTINO, N.D.
Osteoporosis is a progressive yet silent loss in bone density where your bones become porous and brittle promoting the risk of fracture. Bone is actually not a hard and static substance in our body. It is a dynamic process with cells constantly remodelling our bones by breaking it down or building it up. The majority of women get a diagnosis of osteoporosis after the age of 50 but did you know that osteoporosis is a paediatric disease that manifests itself in adulthood? Bone mass acquired during your youth is an important determinant of the risk of osteoporotic fracture later in life. It is important to have the highest peak bone mass possible by the age of 18. This can be achieved by having a very active childhood with lots of jumping to stimulate bone growth. After age 30 it is normal to have a yearly bone loss. This is why it’s important to build our bone reserve early. If you’re past 30, don’t worry. There are still lots of things we can do to improve our bone health. The classic “cure” for osteoporosis is calcium. Yes, your bones are mostly made of calcium so it is natural to think that if our bones are brittle, they must be lacking calcium. This may not be untrue, but research is finding out that it’s not that simple. By supplementing with calcium alone, there is actually an increased risk in cardiovascular disease. This is because the circulating calcium gets stuck in our arteries forming plaque. To reverse this phenomenon, we have long been missing an important nutrient called vitamin K2. I will discuss this special vitamin below, but first let’s talk about milk. Did you know that women in Korea don’t suffer from osteoporosis? Why? Well one theory is that they don’t drink milk! We have been brain washed by the dairy board that milk is a necessity for strong bones. 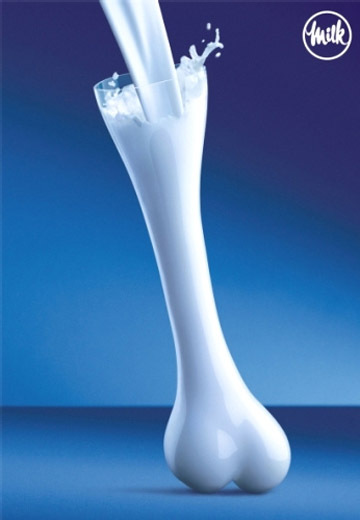 Can you picture the commercial with the white liquid filling the bone shaped container? Do you realize that we are the only mammals on earth still drinking milk after weaning and on top of that from a completely different species? Milk like dairy contains a lot of good minerals however it is also acidic in nature. Too much dairy, meat and coffee make your body acidic and to buffer this (in order to keep our blood at neutral pH), we dissolve our bones because this is where all the minerals exist that act like a base. On the other hand, foods that are more basic in nature and spare are bones are, you guessed it, green leafy vegetables! Make sure half of your plate of food is vegetables. Now back to vitamin K2. Vitamin K2 is a fat-soluble vitamin just like its sister K1, but K1 is a lot more well-known for its role in blood clotting. Several human trials have found that vitamin K2 is effective in treating osteoporosis. 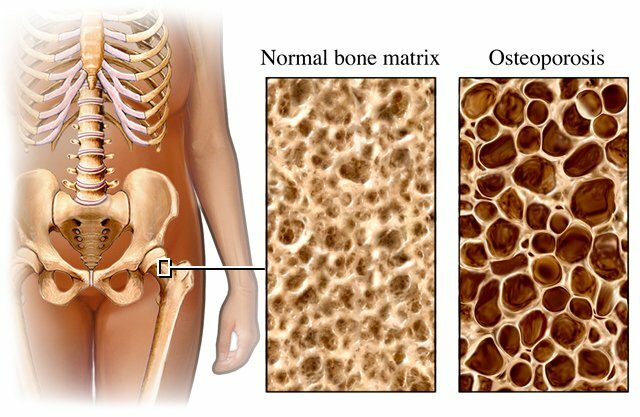 The study shows that vitamin K2 reduces bone loss in postmenopausal osteoporotic women. In fact, vitamin K2 increased their BMD (bone mineral density) especially when combined with the popular vitamin D3. How does vitamin K2 do this? Unlike K1, vitamin K2 has been demonstrated to inhibit calcification of arterial plaque and thus decrease coronary calcification. It does this by shunting the circulating calcium from the arteries to the bone. By extension, vitamin K2 is excellent not only for your bones but also for your cardiovascular health. We are just scratching the surface of the benefits of vitamin K2. For a more detailed list, read the book “Vitamin K2 and the Calcium Paradox” by Dr. Kate Rheaume-Bleue, ND. The only caution with taking vitamin K2 is if you are on blood thinners such as warfarin that antagonise vitamin K function, you should not take vitamin K. The reason is that although vitamin K1 is mostly responsible for the clotting cascade, vitamin K2 may also have a minimal role with clotting. The upside is that a large number of clinical trials have yet to report any adverse effects taking vitamin K2. Vitamin K2 is highest in the Japanese fermented soy, Natto. The great thing about Natto is that it is vegetarian; however it tastes like moldy socks! 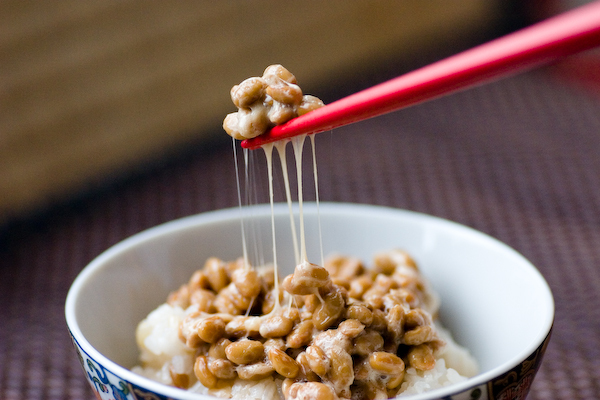 If you can stomach it, eat Natto regularly. The other source of vitamin K2 is in animal products. North Americans eat lots of animal products, yet we are deficient in vitamin K2. The reason we are deficient in this vitamin is because grain fed animal foods are lacking in vitamin K2 as opposed to the free-range grass fed animals. When cows, chickens or pigs consume green, chlorophyll containing plants (grazing) they convert K1 to K2. You can see that animals raised on grains have white fat, whereas animals that were allowed to graze the meadows have a more yellow fat, indicating a higher level of vitamin K2. By extension, grass fed cows produce milk, cheese and butter and grass-fed-free-range chicken produce eggs that actually contain K2. You want to look for a deep orange yolk. Didn’t I just say that animal products are more acidic and should be avoided? Yes, this is still true, however if you do eat meat products, make sure to demand for them to be grass fed. The alternative is to supplement with vitamin K2 capsules. If you chose this option, make sure the vitamin K2 is in the MK-7 form and not in the MK-4 form. MK-7 is the natural form with a longer fatty acid chain making it more absorbable than its synthetic counterpart. Please, reach out to your local farmers and let them know what you want. As a consumer, you vote every time you make a purchase. Unfortunately, it is hard to find grass-fed products in grocery stores today. In fact, many companies seem to brag with their “natural grain-fed” labels on their meats. If only they knew! For more information on other minerals and nutrients as well as dosages to prevent or stop the progression of osteoporosis, book an appointment with me soon!